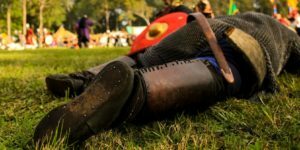 There is something for every Lord and Lady at the Abbey Medieval Festival BUT if ever there was a festival demonstrating male prowess, strength and survival skills, this festival could be described as a very male expression. My Lords…we have tried to pick a few to summarize ….but you simply have to see them all. Located in the Castle arena, this competition is hosted by the Company of the Phoenix with entrants hailing from various re-enactment groups participating at the festival. The Tournament of Strength and Skill is a medieval obstacle course designed for training for the field of battle and to test the combatants’ physical prowess. Made up of obstacles to test a number of important skills that a combating Lord would require on the field of battle such as speed, balance, strength, ability to vault a horse and accuracy with a spear, lance and sword. You can’t possibly watch this and not engage your male competitive spirit. While this is not a performance, you do not want to miss Cottereaux’s ‘Behemoth’, the largest functioning medieval Trebuchet in the southern hemisphere. It will showcase its firepower twice a day. A Trebuchet (French trébuchet) is a medieval siege engine of catapult or stave sling design, and functions by the use of a swinging arm to cast a projectile. The traction trebuchet, also referred to as a Mangonel, first appeared in Ancient China during the 4th century BC as a siege weapon. During sieges, heavy stones were cast sometimes with oil and fire to damage castle walls and while it would be very tempting to use the Trebuchet to hurl naughty little Lords afar, the Sheriff would not encourage this practice. Travel back in time to the Dark Ages (Byzantine era) by taking a stroll through the Commons where Jorth Gar – the New Varangian Guard is located. The Byzantine Emperor Basil II formed the Varangian Guard to act as his elite personal bodyguards. Membership initially consisted of the fierce Rus Vikings, however after 1066, the ranks of the Varangian Guard swelled as mighty Saxon warriors sought membership. The rewards were lucrative and their reputation was legendary. It was not easy to join the Varangian Guard as their battle skills were exceptional. Prospective members not only had to pay to join, they had to prove themselves worthy often by a show of combat skill against existing seasoned veterans of the elite Varangian Guard. The re-enactment group Jorth Gar will present a series of single combats and heroic fighting. In their day, the warriors of the Varangian Guard needed to acquire and maintain their skills and learn new technology. This combat display is a crowd engager and demonstrates the variety of weapons and fighting techniques available to the Varangian Guard. You will be in awe of the Varangian Guard. Watch different Crusader groups combat at Skirmish at Sephoria (on Sunday only in an army format), shooting down in to a well or down from the top of castle wall, speed shooting and other demonstration of various Turkish shooting techniques. There’s something for everyone at the Abbey Medieval Festival, after all , learning is not just confined to the young. Find out more about what’s on a this year’s Abbey Medieval Festival, and get your tickets here. The Templars are a historical re-enactment group based in Brisbane. They portray the military order of the Poor Fellow Knights of Christ and of the Temple of Solomon, more commonly known to history as ‘The Templars’. At the Abbey Medieval Festival this year, you’ll find the Templars encampment in the Crusader Quarter. The Templars host the Kingdom of Heaven Tournament on Saturday afternoon in the castle arena, where they contest the field against invited knights from the other Crusader era re-enactment groups. You will also see them working closely with their friends at the Order of the Horse, who portray the Templars’ historical adversaries, the Saracens. On Sunday afternoon, you’ll see Saladin and his mounted warriors attack the Templars in the Battle of Hattin. And each day, in the late morning in the Crusader Quarter, you will hear the glorious Gregorian chant performed by Schola Cantorum, as the Templars bless the pilgrims before they set out for the Holy Places. Historically, Templars had the task of safely escorting pilgrims to Jerusalem and the other Holy Places in the Jordan Valley, and held castles that protected the Crusader Kingdom of Jerusalem. They wore a distinctive garb of a white woollen cloak bearing a red cross, and carried shields of simple black and white – the same colours as their traditional standard, known as the Beauceant. In their encampment at the Abbey Festival, the Templars depict a camp outside the walls of the Templar stronghold of Chateau Pelerin on the shores of the Mediterranean. The year is 1229, when a truce had been signed by Frederick II that once again allowed Christian pilgrims passage to the Holy Places in Jerusalem and the Jordan Valley, which is now held by the Saracens. Come and visit the Templars encampment and see their exciting performances at this years Festival! Horses, Hounds, Hunters and Farmers is a brand new multi period reenactment group that has been established to show the animals and people in non warfare roles in the dark and middle ages. Horses, Hounds, Hunters and Farmer (HHHAF) gleefully borrow people and their animals from many of the fine re-enactment groups that attend the Abbey medieval festival to join us in showcasing kit, knowledge and, of course, awesome animals! HHHAF strive to have a range of friendly and safe animals (though just horses and hounds this year!) that people can ask questions about, and gain an education on the animals roles and their equipment in medieval and dark ages. Visitors to the Abbey Festival this year can touch and feed their animals, and people too… but ask permission first! You may see the HHHAF group members riding around Abbeystowe with their horses, or going on a hunt with their hounds around the Festival grounds. At their camp site this year, there will be horses to see, and hounds to marvel at! Hunters will prepare a rabbit for the dinner pot, horse equipment, saddles and bridles from different periods, a hunter talking about setting some snares, a chat about what medieval horses ate, and even a Noble Lord talking about on the medieval farming practices on the high middle ages. Please come over and say hello – they would love to meet you! Meet Horses, Hounds Hunters and Farmers, and their wonderful animals this year. Buy your tickets now! Check back soon for another Reenactor group. Prima Spada School of Fence is a historical fencing school operating in Queensland, Australia. The School currently has three Salles (fencing halls) located in Brisbane, Maroochydore, and on the Gold Coast. Prima Spada take their school on the road, and will be another highly valued group attending and demonstrating their talents and skills at the Abbey Medieval Festival again this year. Prima Spada is a founding member of the Australian Historic Swordplay Federation, now known as Western Martial Academies of Australia (WMAA). Based on the work of Spanish masters of the 16th and 17th centuries, Prima Spada teaches Renaissance European swordplay as a modern sport. From the duelling swordplay of the 16th century, Prima Spada has created a challenging and enjoyable activity which can be appreciated at many different levels – as a martial skill, as a sport, or as a movement art. However, Prima Spada seeks to do more than simply reproduce the mechanics of duelling swordplay; the philosophical principles of honour and courtesy that were a fundamental part of the character of a 16th century noble, are also a key facet of what is taught in Prima Spada. The practical and philosophical approach of Prima Spada creates an enjoyable and accessible form of swordplay where the emphasis lies firmly on quality of execution rather than brute strength or speed. This art resonates with dance movement, and is a unique, flamboyant combat style with a theatrical sensibility. The Prima Spada style helps its students to develop considerable confidence in themselves and their abilities. From the very beginning, students are constantly challenged to excel at the techniques taught at their level, and encouraged to demonstrate their ability in stylised combat. This also requires one to accord the same respect to one’s fellow students. This is bourne out in School’s motto “Honourable in victory, gracious in defeat”. See Prima Spada and witness this age old art of swordplay in action at this years Festival! More on other Reenactors groups here soon! Company of the Dove was a free company, a late medieval army of mercenaries acting independently of any government, and thus “free”. They regularly made a living by plunder when they were not employed. They were based in Brittany, France, at the start of the Hundred Years War, a series of conflicts waging from 1337 to 1453 between the Kingdom of England and the Kingdom of France, and their various allies, for control of the French throne. Starting out initially as a traditional archery group, Company of the Dove are mostly English archers, with some men at arms, and their families, and encourage all interests in the medieval way of life. They have been a loyal visit to the Abbey Medieval Festival for many years, and continue to draw public interest not only in the period of time, but in their individual group’s activities and encampment. Company of the Dove is a family based medieval re-enactment group who adhere to Qld Living History Federation standards, and are involved with weapons training, traditional archery, clothing, furniture, music, encampments, medieval cooking and feasts, as well as studying and re-enacting all facets of medieval life in the mid 14th century (1348-1361). They run workshops to help their members get more involved in medieval tasks and equipment and they make a lot of our own equipment. To meet Company of the Dove this year, buy your tickets now! Get to know some of the other Reenactors groups here.